Slideshow: Among of the most unsubtle and performance-focused cars ever built, with a name to match, was AMG’s Hammer series of W124s. As MC Hammer was making a name for himself in the world of hip-hop, a relatively unknown engineering company in Germany was building its own Hammers. 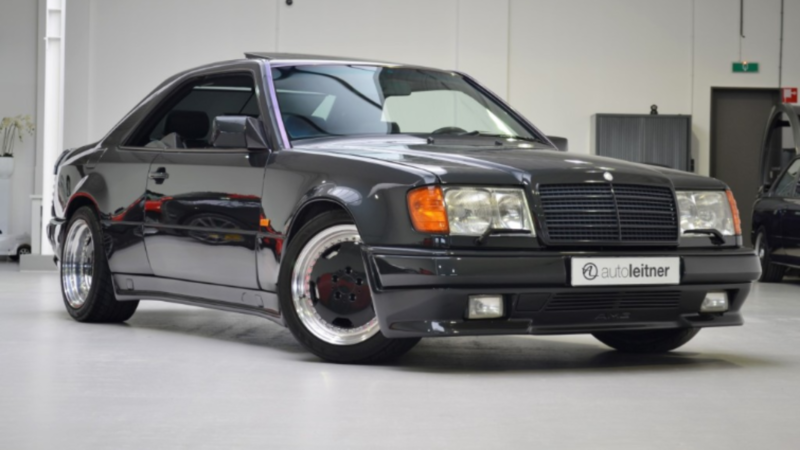 In the 1980s, AMG released a car which typified the anxiety of pre-unification Germany. The AMG Hammer was an inelegant W124 hot rod and a sign of things to come from the aftermarket tuner that would eventually be absorbed by Mercedes-Benz itself. In 2018, AMG is responsible for a handsome dividend of the company’s profits. AMG’s idea was simple. Mercedes-Benz didn’t have a performance car in its product portfolio and BMW’s first-generation M5 was garnering all the accolades. Something had to be done as a counter, something dark, sinister, and with a larger capacity V8. That something was the W124 based AMG Hammer. If you think 'stance' is a 2018 thing, imagine this in 1988? 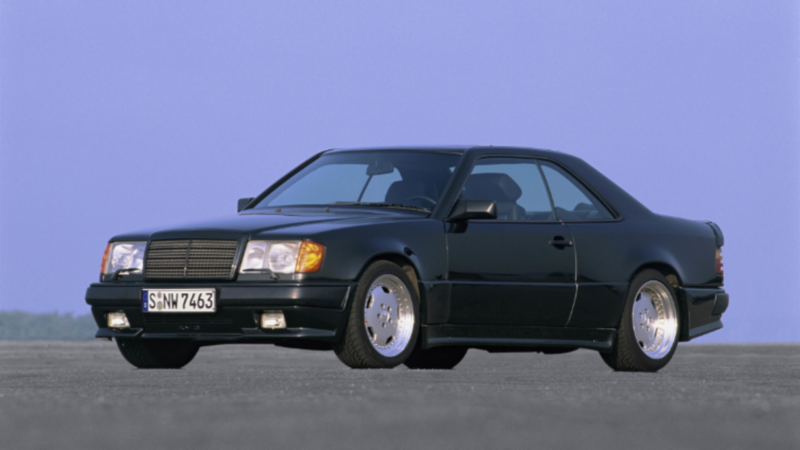 AMG delivered its Hammer in all W124 body styles, with the exception of the cabriolet. The most desirable Hammers were a series of especially rare widebody coupés, evolved from the 300CE range. The W124 coupé’s no-B-pillar design made it an icon and AMG exploited the factory styling brilliantly with its own modifications. The fender extensions were substantial, adding width to the squared-off and fully proportioned W124 design. The ducktail spoiler is an absolute work of automotive art. Three-pièce Monoblock alloy wheels added to the geometric styling theme, and all AMG Hammers were finished in one color and one color only: Black. If Darth Vader ever visited a Mercedes dealership, this is what he’d have bought. >>Join the conversation about the AMG Hammer right here in MBWorld. AMG’s Hammers looks intimidating but what made it deliver on the promise of its appearance, were a range of potent Mercedes V8 engines. Three options were available to Hammer buyers, with AMG’s technicians able to increase the size of Mercedes-Benz’s 5-liter 32-valve V8 to 5.6- or even 6 liters of swept capacity. AMGs aren’t subtle and it stands to reason that the 6-liter Hammers were the ones to own, as they represented the ultimate incarnation of these supercar-baiting W124s. 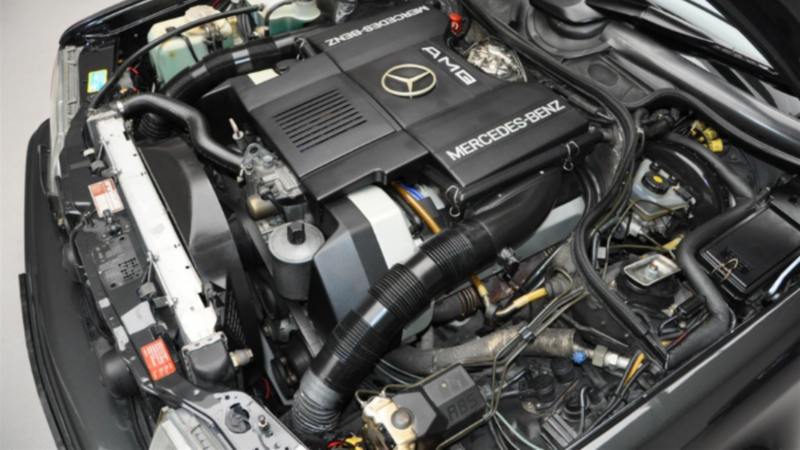 The 6-liter AMG-tuned Hammer was good for 375hp and 400lb ft of torque. Those numbers might sound underwhelming by 2018 AMG V8 standards, but thirty years ago, they were enough to make these Hammers more than an annoyance to 911 Turbo and Lamborghini Countach owners. The W124 range represented Mercedes-Benz’s best values of build quality and elegant cabin materials. 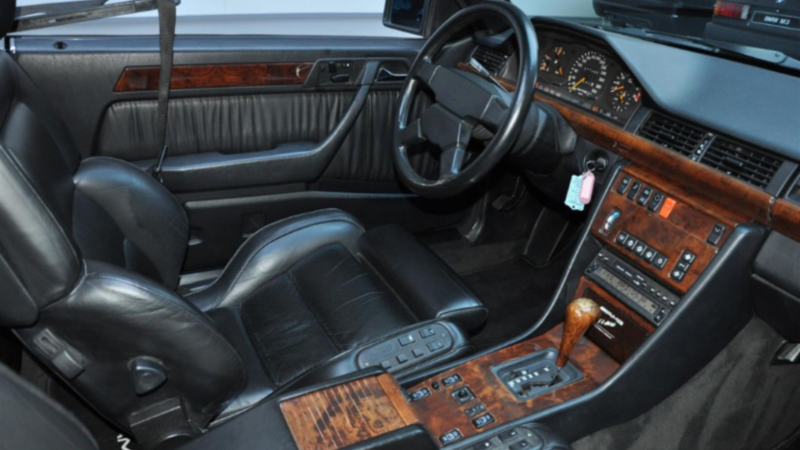 AMG change much of the excellent factory W124 cabin, wisely choosing to leave the quality wood inlays as they were. Perhaps AMG's most recognizable alternation to the W124 interior is the steering wheel. Gone is the classic oversized four-spoke W124 helm, replaced with a smaller diameter sporty steering wheel, to allow quicker feeding of the wheel through the hands during dynamic cornering. The Hammer’s steering wheel didn’t feature a three-pointed star in the middle, as with all other W124s. AMG’s logo was engraved into the boss instead. A set of special AMG floor mats were optional too, detailing whether the Hammer was 5.0-, 5.6-, or 6.0-liter. The performance of these 6.0 Hammers bordered on the ridiculous for a late 1980s car. Despite a planetary geared four-speed automatic transmission, which shifted with languid laziness between its ratios, the Hammer was capable of the benchmark 0-60mph sprint in only 5.1 seconds. Only having four forward ratios didn’t limit its top speed credentials either. Unlike other Mercedes-Benz’s of the time, AMG’s cars were never speed restricted and, therefore, ran way past the 155mph governors fitted to most other German vehicles. The Hammer would push on to a top speed of 190mph. One element that undoubtedly assisted in the performance of all Hammers were that they didn’t weigh much by contemporary luxury performance car standards. Even the largest capacity 6.0 Hammers registered a kerb mass of just over 3600 pounds.